Focused on AM General military surplus trucks and other key military surplus items. Thank you for reading this article. If you enjoy it, then please comment and share. This is simply me putting together an X-Door which was recently painted. The goal of this article to simply share what I do. Said in another way, this isn’t a detailed instructional article which necessarily follows the military process or any other professional process. Just what I do. All content here are for reference purposes only: Always consult with an expert if you are not one. For a detailed list of bolts I used please see here. With all that said, here we go! Step 1: You’ll need bolts, lots of them. Make life simple for yourself. What do I mean, when you start to disassemble your first door what you should do is grab a small empty box and gather all of your bolts off of that door. I don’t try to save all of the washers and nuts. I try to have one complete bolt, nut, and washer(s) per given set. Where to me, a set is the number of bolts, nuts and washers you would need to reassemble a given part, or example the the armrest / latch, the hinges, latches … For example, the latch has 4 bolts, 8 washers, and 4 nuts. In this case, I would retain 4 of the bolts, two washers, and one nut. When done you should have all of the bolts, and a single set of nuts and washers per set. Then, I take this box to my local Fastenal and ask them to gather everything X 4. Note: More than likely Fastenal will not have the exact length for every single bolt. Whatever you do, don’t get anything shorter, a tad bit longer will be fine. Note: Consider getting extras of everything. You will likely lose a few washers and a few nuts. Step 2: Installing the window. I like to start off with the door upside-down. That allows me to slide the window into place by myself. Note: Don’t forget to install the window rollers. Otherwise, your window will have too much play within the frame. When installing the window I like to put the top window rollers in first, then slide in the window frame just passed the halfway point. Then, I install the bottom window rollers and finally slide the window all the way up and lock it in place. My next step is to install the window stop assembly. I do this next because I want to make sure the window doesn’t slide off and brake if I accidentally slip the door to the right side up position. It could be argued if this should be the next step or if should come only once your lock / latch has been installed. I personally do it next. This is very straight forward and not much to be said here. The only thing to note is that you should make sure not to forget the door spacer that goes between the door and the latch from the inside. Next you want to install your handle from the outside. Not matter if you purchase the locking handles or the standard ones the process should be identical. Once you have your handle bolted up, not tightened down just bolts, washers, and nuts in place, then you want to connect the door latch road from the actual latch to the actual latch. Once you have the latch road in place, then you want to make sure your spring is attached and under tension. Then you want to confirm that your latch will lock in place and released when you unlatch it from the inside or outside. Test this out a few times. Finally, you want to install your hinges. You don’t want to tighten down the bolts. Just get the nuts on and tighten it just so it’s not wobbling. Once you hang the door and line up the door latch with the striker and only then you want to tighten down the hinges. Note: don’t forget to install your limiting strap retaining. Otherwise, you wont be able to connect the limiting strap from the body to the door and your door will swing open all the way and potentially scratch by rubbing on the mirrors or other doors. Note: You want to pay attention to the hinges for you do have a right and left. Here is a time-laps video of everything explained above. Thank you for reading this article. If you enjoyed it, then please comment and share. Check out trucks that Damage Control Customs has to offer here. Click here for parts offered by Damage Control Customs here. Click here for a consolidated HMMWV how to articles and videos. If you have any questions please feel free to reach out directly or fill out the form below and you will be contacted. Note: Several of the pictures posted on this blog are been pulled directly out of a google search and don’t belong to me. 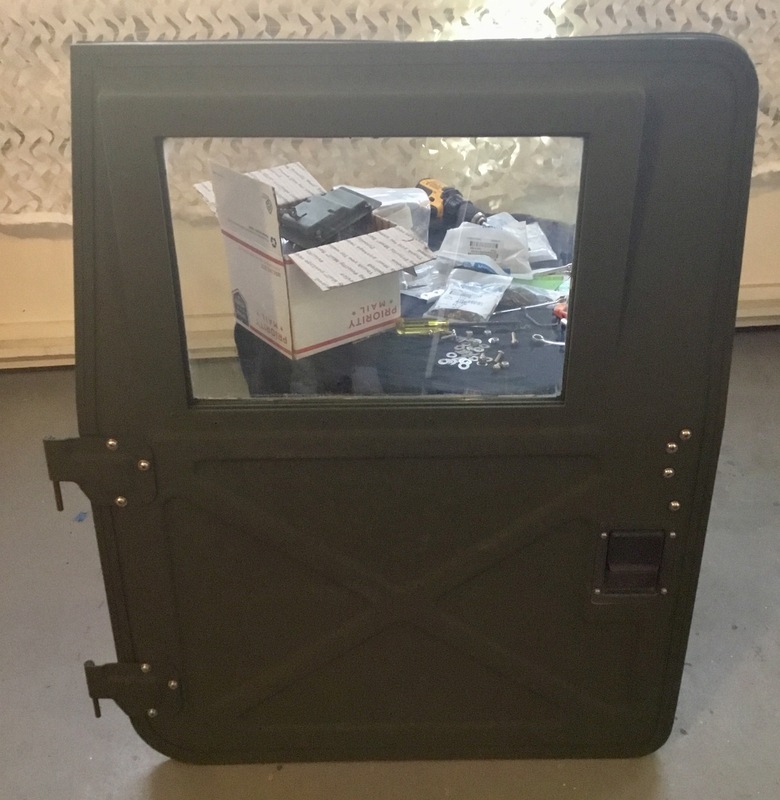 I’m going to share some of my experiences and lessons learned on how to install a turret for your slant back HMMWV. Here is a quick video of everything below. You first want to select your turret setup. Make sure you have the right bearing, the right turret support. If you have an older style turret with a smaller bearing you may want to think twice before adding a heavy coupla or shield. Also, before getting started, make sure you currently have a c-pillar, if not you can get one here. I like to start off with the turret support. Scrape off all of the old gunk, grind and sand. Then you want to disassemble your hatch. Make sure to take lots of pictures because you will need them as a point of reference upon assembling. Take all of your bolts to your local Fastenal or tractor supply and purchase brand new stainless hardware. Do yourself a favor and don’t go to lows and other such stores, you will be hard pressed to find everything you’ll need and you’ll pay a lot more. Make sure to buy extras of each nut and bolt, you will lose some. Once you have it completely disassembled, go ahead and start sanding each component one by one. Once you have everything sanded and prepped. Then, move to priming and paint. In my case I’m using tan primer. Also, the interior of my truck will be green while the exterior will be tan, so I will have to pay attention to what I paint what color. Finally, make sure to use the right kind of primer based on the paint you’ll be using. If paining with CARC, the you will have to use the correct primer with the epoxy. If you need details on this, then message me and I will be more than happy to give you the details. Then, remove your roof and if necessary remove your old insulation. If necessary, then use Polyurethane Sealant to close the gaps between where the roof lines meet. Then spray on your adhesive on your roof and insulation. You want to go vertically, then go over it again horizontally. Lesson learned, cut out where your support and b-pillar come into contact with your insulation. Otherwise, your roof will not sit low enough. Next you want to install your c-pillar. To do that, you will have to remove one of your sponsons, slide in your c-pillar, make sure the bolts line up, and reinstall your sponson. The you want to install your support. Followed your roof. Finally your lock rings. Once you’re happy with the fit of the roof and turret support then you want to run some of the sealant around where the roof and support meet. Then place your bearing over the support and apply sealant again. Attached a few bolts to hold the bearing close to the support and leg that dray over night. On the follow day, you want to create a gasket to go under roof retainers. To do that, you can buy a large sheet of 1/8 gasket, you can buy shower liner, or you can use bike tire tubes. I would discourage using bike tire tubes because I believe that would be harder to work with. You can buy the shower liner, which is what I used, here. You want to make sure your gasket is big enough to go passed your roof retainers, you can go back and cut it to exact fit once everything is dry. You also want to add s’more more of your sealant under your gasket as well as under and around your roof retainers. 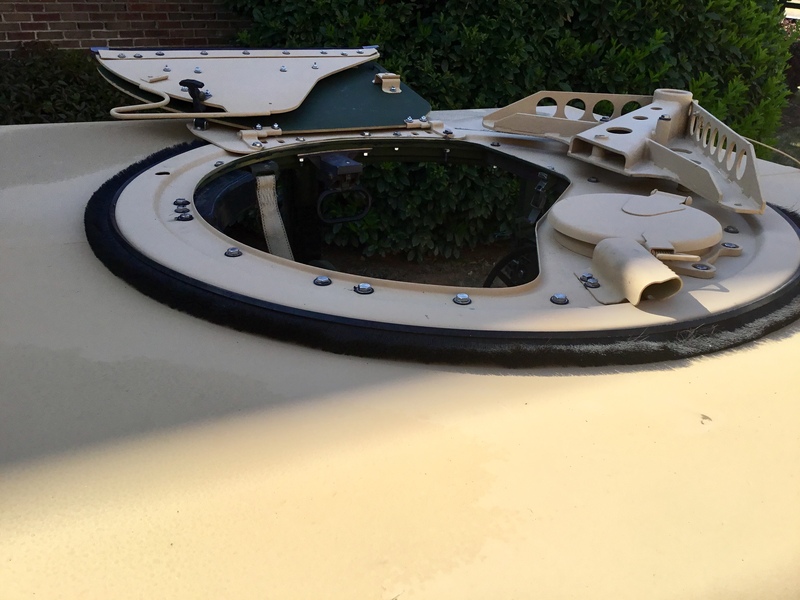 You want to go around the whole turret support and make sure your roof retainers are on nice and tight. Leave this again over night. (1) this sealant will not be 100% day in 24 hours but will be dry enough to work with. (2) make sure not to add sealant on the bearing and the gasket you just made, the gasket can temporarily go onto the bearing but you will want to come back and trim it just passed where the bearing spins. Now you can start to assemble your hatch back together. Remember those pictures you took before taking it apart? This is when it will come in handy. Finally, a huge thank you to those who continue to train me. In this specific build, I have to thank Todd. I think we both educated each other but I had a lot more to learn.